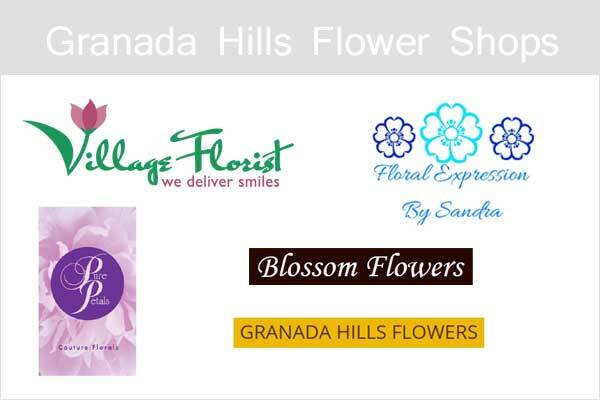 Full list of Granada Hills flower delivery services, florist and flower shops. Zip codes – 91344, 91394. Granada Hills flower shop providing same day flower delivery service in Granada Hills area. Takes orders online or in-store for almost every occasions. One of the leading Granada Hills flower shop, offering in-store and online flowers and creative gifts to suit any style or budget. Sympathy and funeral flowers, wedding flowers, prom flowers, event flowers, plants and unique gifts delivery. Services includes – Wedding and Party Consultations, On-site Holiday & Party Decorating for Homes or Businesses, Corporate Event Planning & Designing for Functions, Wedding & Party Rentals. Same day in-store and online flower delivery in and around Granada Hills, CA. Area serves – San Fernando Valley & Santa Clarita Valley. Florist in Granada Hills CA. Located in the Knollwood Shopping Center and serving the San Fernando Valley since 1989. Shop Hours : Opens daily. Pure Petals Couture Florals offers wide range of creative, couture, custom, traditional and modern designs specifically tailored for you and your budget.